Founded in 1843 for the sons of Church of England clergy Marlborough College is an independent co-educational boarding and day school situated in Marlborough, Wiltshire. 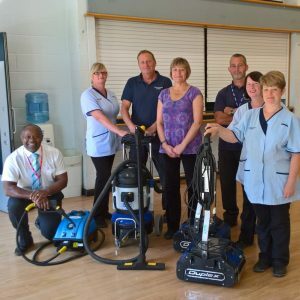 To help maintain the high standards of cleaning and hygiene demanded for Marlborough College’s prestigious facilities they chose Duplex approximately 20 years ago and have continued to add to their fleet of machines ever since. The college’s Sandra Cleverley commented “Many thanks for visiting us at Marlborough College last week, great training provided by you – as always. Marlborough College has used Duplex machines for many years-there are a lot of cleaning machine companies in market now but we use Duplex because they have proved to be robust, multi-tasking, reliable machines making them long term cost effective. Duplex offers excellent after care support and will readily supply refresher training for staff on the use of the equipment.